Pres. Obama's summer vacation on Martha's Vineyard began in earnest Sunday as he hit the links for a round of golf - his 300th since taking office. He has shown himself to be the most avid golfer of any president since Dwight Eisenhower, who is said to have played 800 rounds in office and installed a putting green on the South Lawn of the White House. "He shoots in the mid-80s to low 90s," says an occasional golf partner of Mr. Obama's, speaking on condition of anonymity. He further describes the president as a competitive player and a serious scorekeeper on the golf course. "Every shot counts," says the occasional partner, based on over 20 rounds played with Mr. Obama. "He keeps score 100 percent," and doesn't take mulligans - do-over shots for which President Bill Clinton had a well-earned reputation on when playing golf. In an interview last week with the Golf Channel's David Feherty, Mr. Obama said of his golf handicap, "I'm an honest 13." By my count, this is Mr. Obama's 38th time playing golf on Martha's Vineyard during his seven visits split between three courses: Farm Neck in Oak Bluffs, Vineyard in Edgartown and Mink Meadows in Vineyard Haven. But his most frequent venues for golf are the courses at Joint Base Andrews just outside D.C. He has played there 107 times. He has also played 54 times at Fort Belvoir in Virginia and 27 times at Marine Corps Base Hawaii. He has played only once on foreign soil: a round on April 23 this year with British Prime Minister David Cameron at The Grove Golf Club in Hertfordshire, U.K., north of London. Mr. Obama's most frequent golf partners are current and former White House aides. Trip Director Marvin Nicholson has played 186 times, by my count. The golfer-in-chief also likes to play with pals from Hawaii and Chicago, and sports figures -including retired NBA star Alonzo Mourning - who has played 14 times with the president. His foursome today at Farm Neck on Martha's included Chris Paul of the L.A. Clippers. Mr. Obama rarely plays with other politicians - though he has played 7 times with Vice President Biden. In a fence-mending gesture, Mr. Obama invited then-House Speaker John Boehner to play on one occasion in June 2011 along with Gov. John Kasich, both Ohio Republicans. The White House allowed a photo op on the first hole. Mr. Obama also reached out to members of Congress in May 2013, inviting three U.S. Senators - two Republicans and one Democrat - to join him on the links. Among them was Sen. Saxby Chambliss, who hit a hole-in-one that day. Also in the foursome were Sens. Bob Corker (R-Tennessee) and Mark Udall (D-Colorado). The press pool got a photo op at the start of that round too. In July last year, Mr. Obama played a 5-hour round in 94-degree heat with three House Democrats: Joe Courtney (Connecticut), Ed Perlmutter (Colorado) and John Yarmuth (Kentucky). An aide to Perlmutter said the next day that the president the congressmen "didn't talk politics at all. They talked sports and family." It has not escaped notice that Mr. Obama has rarely invited women to play golf. On only three occasions to date have women joined him on the links: then-White House Domestic Policy Advisor Melody Barnes once on Oct. 25, 2009, and then-HHS Secretary Kathleen Sebelius on Oct. 10, 2010 and again on May 18, 2013. What the president seems to love most about the game, he has said, is spending time out of doors - outside the White House bubble. "It is the only time for six hours, first of all, that I'm outside," he told Harry Smith in 2009 in an interview for CBS' "Early Show." "You almost feel normal in the sense that you're not in the bubble." He's a leisurely player, spending four to five hours at the golf course most outings. He's definitely not a speed golfer like President George H. W. Bush, who was known to play 18 holes in as little as 90-minutes. His occasional partner says Mr. Obama will joke around on the links, but also "understands the pressure" of the game. Golf also gives Pres. 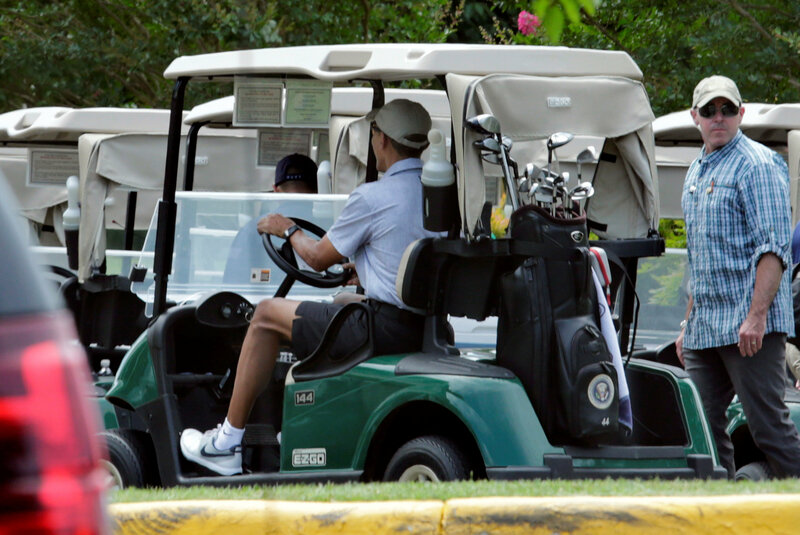 Obama his only chance to get behind the wheel of a motor vehicle - by driving a golf cart. Further, golf is a more gentle activity than basketball, Mr. Obama's first love among sports. Up until November 2013, Mr. Obama played basketball outside the White House at least 49 times. But since then, only rarely. "The satisfaction I get from playing diminishes because I'm so bad," Mr. Obama said of basketball in response to a question at a town hall event last year in Indianapolis. "You just get a little older and creakier," he further explained in an interview with retired NBA star Charles Barkley. He said he worried about taking elbows and the risk of breaking his nose "right before a State of the Union Address." Golf is clearly kinder on the president, who just turned 55. He said "the likelihood of injury (is) much lower" in golf.